In reality, it's quite small. Studio Moziri consist of only a few people. 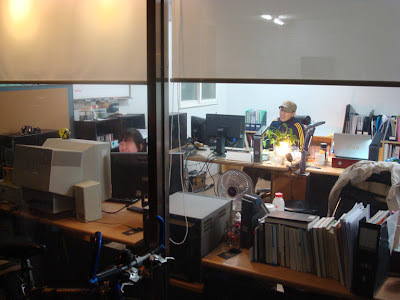 Their office is located on the first floor of a humble street near Namguro Station in Seoul. They have a couple computers, a bunch of books, a light box, and a small plant. Still, Studio Moziri is grand. 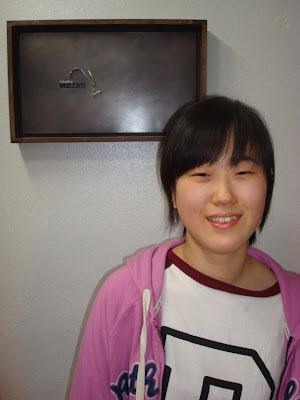 During the day, Kim Yong Chan works as a director at a major animation studio in Seoul. During the night, your likely to find him at the studio he started in October 2006. You may also run into Yun Ga Ram there. She's both Director Kim's apprentice and creative partner. Director Kim is a tall, kind man who some say looks like actor Nicholas Cage. I was interested in learning more about Studio Moziri. So, one night, he let me join him at the studio for an interview. Midodok: Why did you decide to start Studio Moziri. Director Kim: The number one reason is that I want to play. My brain needs to play. So this is my free place to play. The company that I work at during the day is not free because I must make their story. But, this space is free. Ga Ram is free. Our emotions are free. Our plans are free. Anytime, anyday. We might chat about story ideas or eat or watch movies. It is not a job, just art playing. Take a look at the new PipMan & PipGirl Valentine's Day cartoon created by Studio Moziri. Director Kim: But we do need some resulting object and that is our digital stories. We can change the world through digital stories. Or people's minds. Why digital stories? We use a digital medium but the story is perfect analog. Midodok: Huh? I don't get it. Can you explain better? Director Kim: For example, PipMan & PipGirl is an 18-byte story. So many people have cell phones, but some emotion is lost in this form of communication. People will make up for that lost emotion. What is the source? Text. If I send a text message, it doesn't indicate that you are smiling. But if you send a text smile, it lets me know that you are smiling. 8 byte emotion. Midodok: Oh, I get it. So although your medium is digital, the emotions you create are real (analog). Director Kim: Yes. Digital can be handy, simple or easy. The speed is fast. Good. But it has lost too much emotion. We find that emotion and put it into digital. At this point in the interview, Yun Ga Ram arrived at Studio Moziri after a long day of work. Director Kim had told me about Ga Ram's hopes to eventually study at Musashino Art University in Tokyo, the same university he attended. I was interested in learning more about Ga Ram's role at Studio Moziri and her own dreams. So, I briefly interrupted my interview with Director Kim to interview her. Midodok: How did you get involved with Studio Moziri? Ga Ram: I followed Director Kim Yong Chan, ha ha! Here I just get to do what I like to do. I'm not working here, but studying. Midodok: What do you hope for Studio Moziri? Ga Ram: I'm not thinking about that. Midodok: What is your personal dream? Ga Ram: I want to be a director! Midodok: What will you study in Japan? Midodok: What is your favorite animation? Midodok: What kinds of animation would you like to produce? Midodok: Is there anything else you'd like to add? Ga Ram: I love PipMan & PipGirl, ha ha ha! Midodok: Hmmmm, is there anything else I should ask? Director Kim: How about what was difficult about directing the editing of PipMan & PipGirl? Ga Ram: The first thing that was difficult was making their movements seem natural, even though they are just text. The second thing was the timing of the action. The third thing was deciding what PipMan & PipGirl's personality and emotions would be. Midodok: What kinds of stuff do you do here at Studio Moziri besides PipMan & PipGirl? Ga Ram: Drawing. I designed some characters. And some story writing and planning. Ga Ram then brought out some tangerines, took some pictures of me interviewing Director Kim, and then went to her computer to work. Later in the night, her gal pal joined her and the two of them started creating a mashup video of a girl dancing to funny music. Midodok: What's your hope for Studio Moziri? Director Kim: It's too difficult. We shouldn't be thinking about that yet. I just want our freedom and our creativity to continue so we'll make art. I just want to continue. Continue making film or taking pictures. I don't want to be trapped by a position or title. I just want to have a method of expression. Director Kim: I also want to encourage Ga Ram to become an artist and be creative. Her creation is important. There are so many people in Korea that are just drawing like engineers, but I want Ga Ram to be a creator. Me, too. Then, Moziri will have some stories and continue creating. Midodok: By the way, what does the name Moziri mean? Director Kim: It means "a fool" in Korean. We are not perfect. But together we are perfect. That is the meaning. Midodok: Do you plan to create more PipMan & PipGirl animations? Midodok: What else do you do here at Studio Moziri? Director Kim: We have created short stories, dramas, short films, and movies. We plan cartoons, books . . .
Midodok: So you guys just create and create. How do choose decide what to create? Director Kim: I can find ideas by just talking with other people. Like right now, we are talking about PipMan & PipGirl and I might get an idea from this conversation. Human life makes too many stories, but maybe everybody doesn't know how to make this into stories. I know how to use media to make an expression of these stories. It's too easy, just listen and look. Sometimes I tell Ga Ram, you can just walk in the street and you must find a creative kind of new story there. Midodok: It seems so easy and natural. Director Kim: Yeah. I think we have so many stories. There are so many people that have so many ideas, but they don't know how to explain the idea. What we do is plan how to explain that image. Director Kim: One thing I'd like to add is that many people don't want to create animation because it seems too difficult. But actually, it's too simple! Some people have this big view of animation, that you need key artists, storyboarders, etc. But actually, animation is just movement. That is so simple! Midodok: Great, thank you for your time and sharing Studio Moziri with Korea & Animation! Director Kim has created a place where creativity rules. Where learning and experimentation are more important than worrying about financial profit. 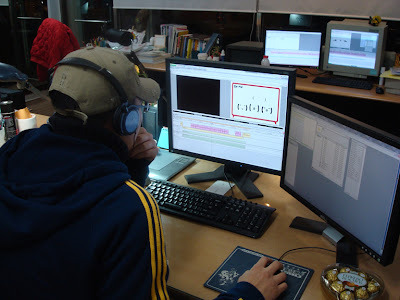 Where, unlike many service animation studios in Korea, creation occurs rather than production. Director Kim has found a way to express himself, entertain us with cute animations, continue learning and help others along the way. That is truly grand! Check out the Studio Moziri website or the Studio Moziri channel at YouTube! Great interview! Are the animation schools better in Tokyo? I wonder if there are a lot of Koreans studying in Tokyo. I'm not sure if the animation schools are better in Tokyo. I'm also not sure if many Koreans study in Japan, although I know a few who have. I do know that Japan is definitely the true inspirational force in Korean animation. If you look at where Korean animators get their inspiration, it's from Japan. I should do a post about that. Re Japan's influence on Korean animation- the father of Korean animation Shin Dong Hong credits Tezuka as his biggest influence. Re this studio, well, never thought I'd read/hear an animator credit Bono-bono as their favorite toon. I guess 'favorite'is determined by what you're exposed to. There's an old mid 90's Korean series that is sometimes aired on Korean TV about animation... you might have seen it late at night Midodok- the host sports an unforgetable giant mullet lol. Anyway, it's very good but they made a list of the ten best animations of all time and they had Tom and Jerry at, I think it was number 2, closely following Yamato at number 1. Bah, Tom and Jerry should not have been in the top ten at all and they totally ignored WB's Looney Tunes. I suppose if we were all influenced by the same things, the world would be very boring. For my money it's the classic French film Fantastic Planet and Peter Chung's Aeon Flux/Reign and some of Hayazaki's films then Futurama and Akira followed by the Looney Tunes/Merry Melodies. But then again the stylised Power Puff Girls and Sinister Dexter and a whole lot of others just look really cool. Oh yeah, nearly forgot. Korean Director Kim Chong Gee of Toto animation studios-- the creator of the most important Korean animated character ever-- credits Disney's Snow White as his biggest influence. I think I have seen that animation show, ha ha! Also, thanks for the insights into some directors and their inspiration. Tezuka himself was highly inspired by Fleishcer and Disney's Bambi, I've read. So, it's all connected. I guess we should keep in mind that influence in Korean animation isn't just necessarily about liking certain animation. Most animators cut their teeth producing works for animation studios from around the world. That undoubtly has an impact on Korean animation. alex/isn't his name Shin Dong Heon? you mean the one who made Hong Gil Dong film.right? Yes, you're right. It has also been translated/written as Hun in the past which is different to Heon or Hung. I'd like to see how he spells it in English himself- it probably would be Heon but you never know. He's at SICAF every year walking around in his beret but when I went there my Korean was too bad to dare pester the old man for a signature. Kim Chong Gee signs his name Kim Chung Gee.